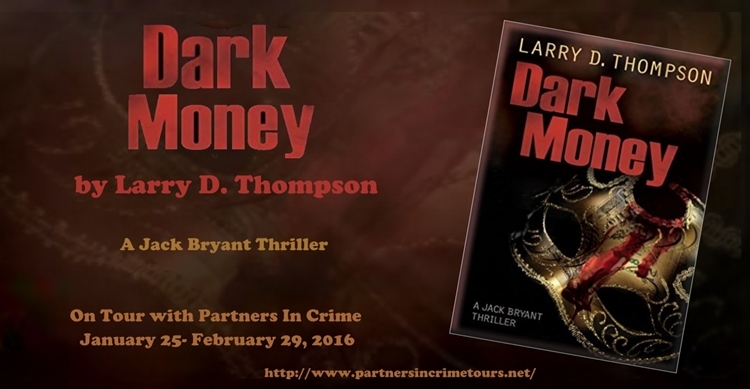 We are pleased to be a part of the book tour for Larry D Thompson’s latest book, Dark Money. During the tour that will continue through the month of February, Mr. Thompson will be found at numerous sites for interviews, guest articles and reviews. You can find his full schedule here on the sponsor’s site, Partners In Crime Virtual Book Tours. Jackson Bryant worked at a high priced law firm until he’s accumulated around 100 million dollars. Enough, right? He thinks so, retiring from the firm to work pro bono for those in need. That’s where we find him. At least until his old military buddy, Walt Frazier, calls on him for help. A mega fund raiser is being held at a mansion in West Texas for Halloween. The governor will be there. Senators will be there. Along with a few hundred people who can easily write donation checks in the millions. Walt needs Jackson’s help to secure the event. But how secure can a party be when many present are legally carrying weapons, and all are in costumes with masks. Another faction is in attendance at the costume party. A woman dressed as a cat burglar. Only she isn’t there to steal. She is there to kill. Within hours, a man is dead, two others injured, the woman is on the run with local, county, state and federal officials after her. The book contains stories within stories. You might think the hunt for an assassin would fill the book, but things are only getting started with the costume party. When the investigation reveals who is responsible, Jackson realizes it is likely to be another Waco disaster. Without giving anymore away the books grows more intriguing as Jackson goes to trial, at the same time working to expose a system ripe for fraud and wrongdoing. Yet even as he investigates, something or someone is manipulating the scenes. With wealthy donors giving money to shielded accounts it leaves a wide open field of who might be behind it all. The political system with PACs and their allowable donations is on trial here as well. no matter which side you may associate with the Supreme Court decision did make it easier for big money–whether that of nations or individuals to wield influence with huge sums of money. Is that the best result for our nation of voters? You must decide that for yourself. Dark Money will surely make you think more about the issue. I enjoyed the book very much. It is an easy, fast reading book that will keep you wondering what would happen next. Hopefully we will be seeing more of Jackson Bryant in future books! Jackson Bryant, the millionaire plaintiff lawyer who turned to pro bono work in Dead Peasants, is caught up in the collision of money and politics when he receives a call from his old army buddy Walt Frazier. Walt needs his assistance in evaluating security for Texas Governor Rob Lardner at a Halloween costume fundraiser thrown by one of the nation’s richest Republican billionaires at his mansion in Fort Worth. Miriam Van Zandt is the best marksman among The Alamo Defenders, an anti-government militia group in West Texas. She attends the fundraiser dressed as a cat burglar–wounds the governor and murders the host’s brother, another Republican billionaire. She is shot in the leg but manages to escape. Jack is appointed special prosecutor and must call on the Texas DPS SWAT team to track Van Zandt and attack The Alamo Defenders’ compound in a lonely part of West Texas. Van Zandt’s father, founder of the Defenders, is killed in the attack and Miriam is left in a coma. The authorities declare victory and close the case-but Jack knows better. The person behind the Halloween massacre has yet to be caught. When Walt and the protective detail are sued by the fundraiser host and the widow of the dead man, Jack follows the dark money of political contributions from the Cayman Islands to Washington to Eastern Europe, New York and New Orleans to track the real killer and absolve his friend and the Protective Detail of responsibility for the massacre.